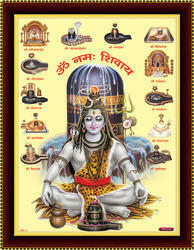 Our organization is counted among the leading suppliers and exporters of utmost quality Gold Plated God Picture. Procured from well known vendors, these pictures are made available in standard sizes. Appreciated for fine finish and high durability, offered products are extensively demanded around the globe. Being a well-established organization, we are engaged in manufacturing a distinguished range of Gold Plated Frame. A wall decor product comes with beautiful colours with lord krishna with radha. We specialize in the manufacturing of large variety of Gold photo frame. The designing has been to give them a very formal look. Therefore it finds its application in corporate offices. These Table Clocks are offered as per the specifications given by the clients. The traditional Rajasthani Art on Photo-Frame is world famous. This typical design is one of the first choice among millions across the globe. Curve Golden Photo Frame is a sleek design sober, good looking and easily fit. We are a top-notch organization, engaged in providing Radha Krishna Leaf Frame. Being an eminent organization in the industry, we are involved in providing a premium quality range of Decorative Wedding Frame. We offer our clients with an impeccable range of Gold Laxmi Photo Frame. These frames are highly aesthetic are available at market leading prices. Our frames are available in numerous patterns, designs, shapes and styles as well as comprehensive sizes. Our frames are designed by skilled craftsmen, who give an exquisite finish to each frame. Peacock gold leaf frames Gold Leaf Frame 24 kt. 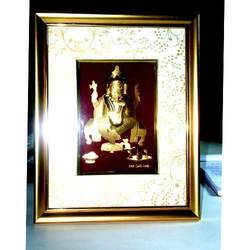 Radhe Krishna Gold Leaf Frame 24 Kt. Shiv Gold Leaf Frame 24 Kt. We are amongst the most reputed names in the industry, offering Gold Leaf Frame.